Just like your family, we are busy. I don’t have lots of extra time to spend in the kitchen, so I need quick meals that my family will enjoy. This dish only takes about 10 minutes to prepare and 30 minutes to bake. A win for this momma! Now, I need to let you in on a little prep that I do to save me time on any dish that calls for chicken. I take a whole chicken and throw it in my crockpot with a little water in the bottom of the dish. I let it cook all night on low. The next morning, I scoop it out of the crockpot. (I say “scoop” because it is falling off the bone after cooking all night.) Let it cool and then remove all the chicken from the bones. Then I divide the chicken up into 2 or 3 quart size freezer bags. Pop them into the freezer and now I have chicken ready to use in my next dish. 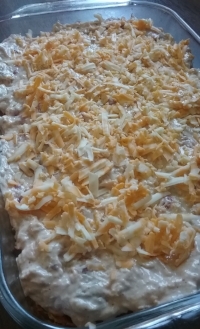 For Cheesy Chicken Dorito Casserole, in a large mixing bowl, I add my shredded chicken that I have saved in my freezer, 1 cup of cheese, cream of mushroom or chicken soup, cream off of the top of our Jersey milk, sour cream, salsa, and taco seasoning. You can always adapt this recipe to suit your family’s taste buds. If you like it hot and spicy, add a hot salsa or if you like it mild, use a mild salsa. Don’t be afraid to change the recipe for your family. Can’t get much easier….just dump it all in and mix it together. Cover the dish with foil and pop in the oven at 350 degrees for 30 minutes. I like to serve this dish with a salad or green beans, and applesauce. In a large mixing bowl, add the chicken, 1 cup of cheese, soup, cream, sour cream, salsa and taco seasoning. Stir together until everything’s evenly combined. Spread the crushed chips into a 9x13 baking pan. Add the chicken mixture, in dollops, evenly out over the chips. Use the back of the spoon to gently spread the mixture out evenly. Sprinkle the last of the 1/2 cup or more of cheese over the top of the casserole. Cover the pan with foil and bake at 350 degrees for 30 minutes. I hope your family enjoys this dish too! P.S. If you are wondering how to have fresh cream from our farm to use in this recipe and many other fantastic recipes, then you need to click here!